The workflow recipes can be followed from the beginning to the end for using SIGMA to analyze ground motion parameters for events in SIGMA. The recipes can also be used in bits and pieces to exercise particular tasks. First the event or the incident which is to be processed must be loaded. 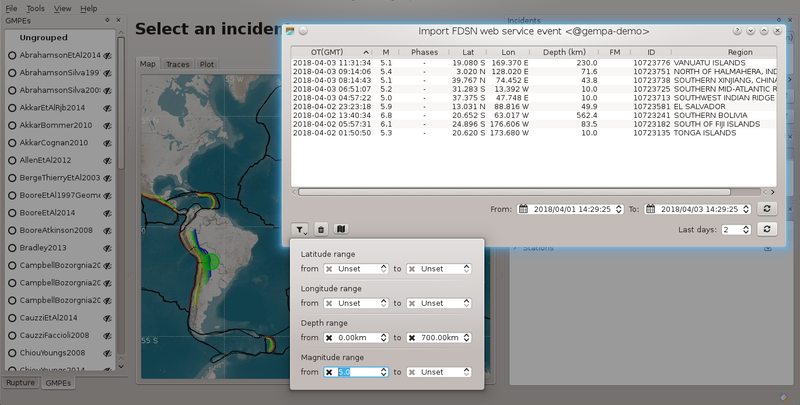 Import an event from the SeisComP3 database or from a FDSNWS provider by selecting Import events. Import an incident by clicking on the incident in the list of incidents. When searching for events or incidents, filter options are available for selecting in the events according to time, region, magnitude and depth. Figure 9: Event selection using FDSNWS and filter options. The focal mechanism may be adjusted to match geological knowledge. Enter the values in the Rupture window. Choose the Rupture widget in the View menu to adjust the parameters. 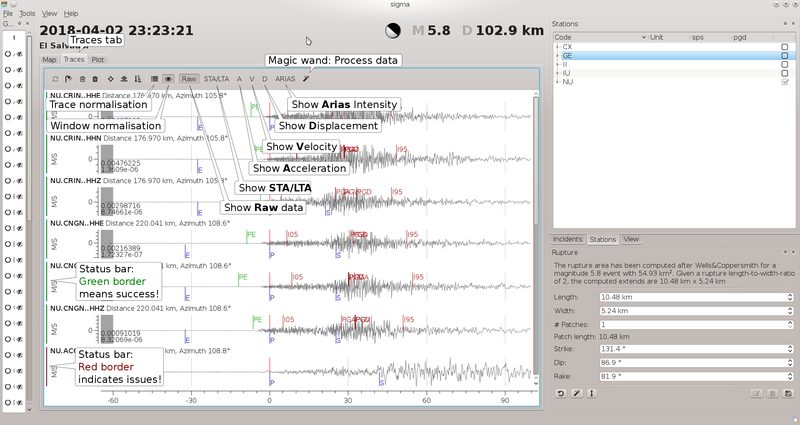 Click on the magic wand to generate the rupture based on the changes. Figure 10: Adjust the focal mechanism by value in the Rupture widget. Chose Edit focal mechanism in the Tools menu of SIGMA. Click on the focal mechanism and drag it or change the tabulated values to the desired value. Click the OK button to use the values within SIGMA. Click on the magic wand in the Rupture widget to generate the rupture based on the changes. Figure 11: Adjust the focal mechanism by dragging the stereographic projection. Choose the number of patches which the rupture should be composed of. Click on the magic wand to start adjusting the rupture by dragging. Zoom into the selected event. Click on one of the circles indicating the edges of segments of the rupture. A cross hair will show up when mouse-over a valid point. Drag the point to reach the desired position and geometry. Note that dragging the rupture will modify the strike angle by keeping the dip and the rake constant. When the rupture is given by more than one patch then each patch can be dragged individually typically impacting the geometry of all other patches. Figure 12: Adjust the focal mechanism by dragging the surface projection of the rupture. Predicted values can be compared with actually measured data. 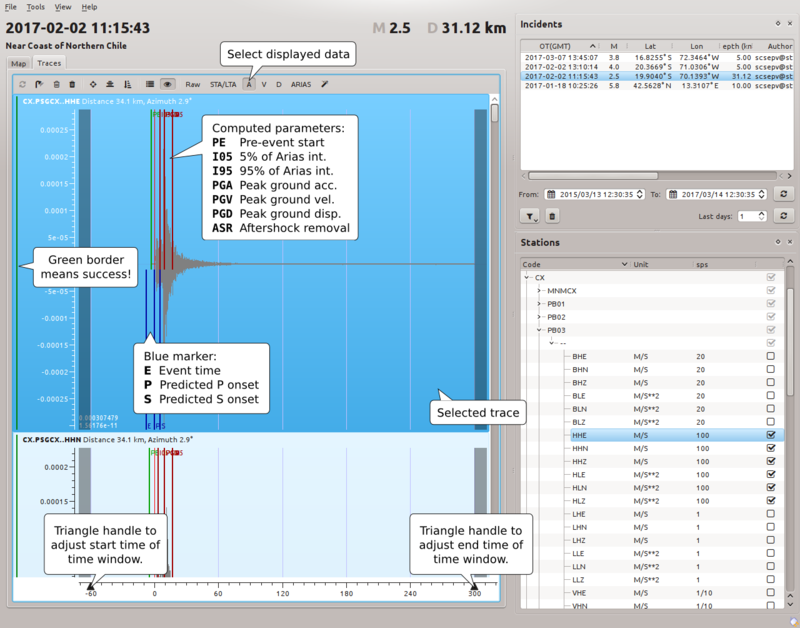 In order to load the data select the stations in the Stations window and click on the Load data button which can be found in the Traces tab. Empty traces will disappear after pressing the shower button. If data are unusable or traces should be deactivated or removed for another reason, select a trace by clicking on it. Clicking on the trash cans deletes the traces. Clicking on the gray trash can also allows to reload the data. 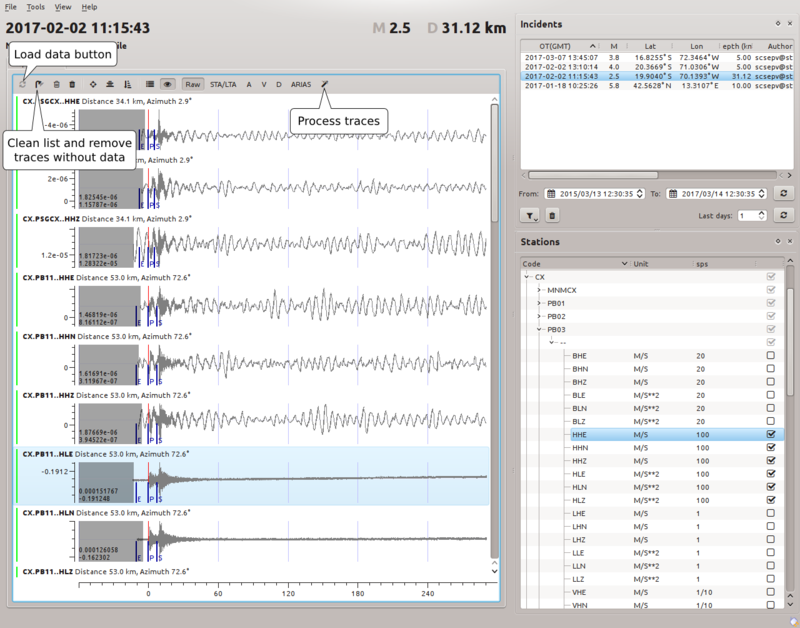 Several traces can be multi-selected using the Control or the Shift key while clicking on several traces. By default, traces are sorted by network and station name. For sorting by epicentral distance click on the sort button. Read the bindings variable channels and select all channels that either match the full string or the string without the last character (component code). E.g. if BH is configured, it will match BHZ, BHN and BHE. If BHZ is configured it will only match BHZ. Furthermore only channels with unit m/s or m/s**2 will be taken into account. 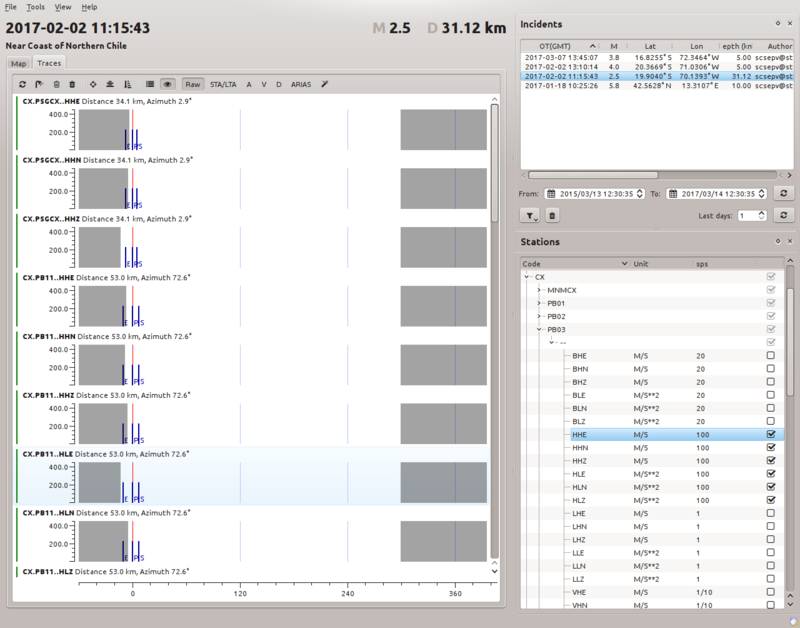 If channels is not defined then SIGMA will select velocity and strong motion channels with the highest sampling rates. Again, only channels with unit m/s or m/s**2 will be taken into account. Each channel selection can be changed interactively in the inventory tree panel. This will automatically add a trace row in the Traces Window. Each activated channel corresponds to a row of the trace list. That list holds all potential candidates for processing. Before processing can be done, the data must be loaded. Once the list is (almost) completely configured, the load button has to be used to load data for all empty traces. During loading all color indicators (left hand border) for traces that are currently loading turn to yellow. Once a trace is complete the color turns into green. If data is incomplete or missing at all then it turns into red. Light colors are used for data acquisition results. The default time window to load data for is [-60s; 300s] around the P onset. This time window can be changed with processing.preEventWindowLength and processing.postEventWindowLength. The time window can be changed interactively by selecting a trace and by moving the triangle handles on the ruler. Once the data have been loaded, the default data processing can be started by clicking on the magic wand. The calculated values are shown on the traces. The color bars to the left of the traces indicate success or possible issues. Switching between processed data including STA/LTA, acceleration, velocity, displacement and arias intensity is provided. The Default data processing including filtering can be modified in the Preferences window. The trace markers in the time where the respective quantities are calculated. PE Processing start time - beginning of computed pre event window. I05 5% of Arias intensity. I95 95% of Arias intensity. PGA Time of the peak ground acceleration measure. 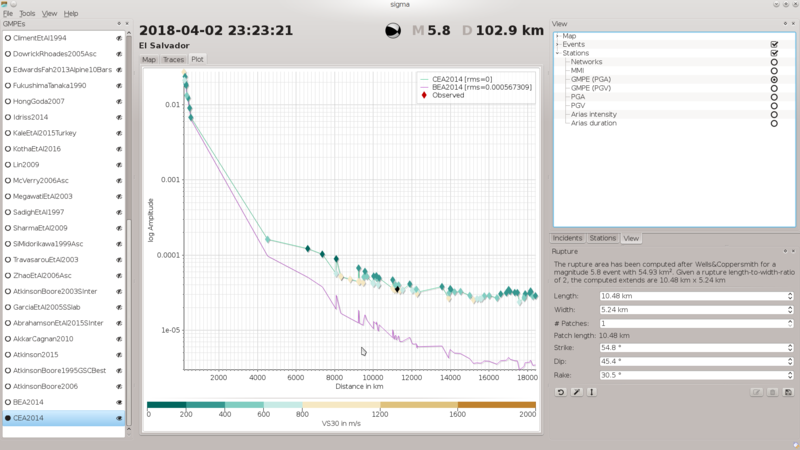 PGV Time of the peak ground velocity measure. PGD Time of the peak ground displacement measure. ASR Aftershock removal detection marker. The input data is trimmed to match exactly the requested processing time window. Because a trace is a list of records and each record covers a certain time range, it is not very likely that the requested time window start time or end time falls on a record border. The input is the raw data of the sensor in COUNTS, so the this processing step applies the gain to the data to convert the COUNTS to the sensor unit: meters per second or meters per second squared. The arithmetic mean of all samples is computed and subtracted from each sample. If input data is velocity then differentiate it to acceleration. The spectrum computation copies the current data and applies several processing steps on them. E.g. the taper and zero padding are not applied to the data used in the next step. Apply the configured window function to the data with configured length at either side. The default window function is the Hann window. Pad the data on either side with zeros. The number of zeros depends on processing.spectra.padLength. If that value is negative then the pad length in seconds is determined from 1.5 * processing.filter.order / processing.filter.loFreq. Compute the spectrum of the data with fft. If processing.STALTAratio is a non-zero positive number then the STA/LTA function is computed. The STA length is the minimum of processing.STAlength and processing.preEventWindowLength. The LTA length is the minimum of processing.LTAlength and the available data window prior to trigger time. The threshold is checked either on the entire STA/LTA trace or only around the trigger time with a configured margin. This margin must be non-zero positive number to be taken into account. If the threshold is not exceeded then the further trace processing is discarded. If pre event cut-off is enabled then a hardcoded STA/LTA algorithm (with STA = 0.1 s, LTA = 2 s, STA/LTA threshold = 1.2) is run on the time window defined by (trigger - 15 s). The pre event window is hence defined as [t(STA/LTA = 1.2) - 15.5 s, t(STA/LTA = 1.2) - 0.5 s]. The data before the pre event window are trimmed. Otherwise the pre-event window is defined between the first data sample and the trigger time. Compute the mean of the pre-event window and removes it from the entire trace. Compute the global linear trend and correct for it. 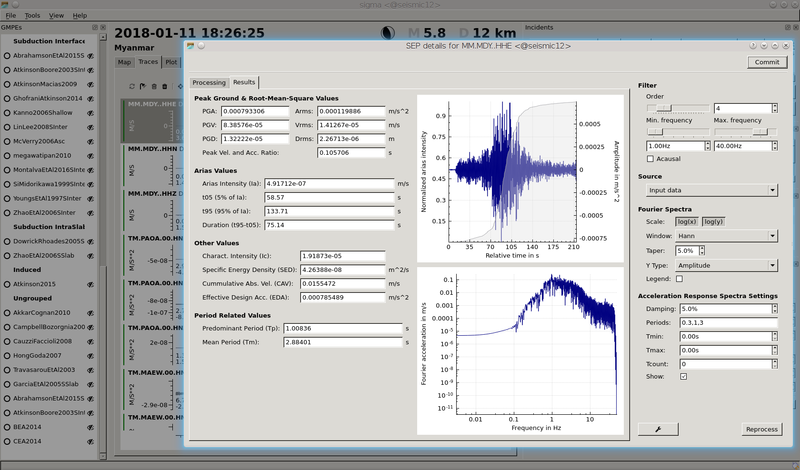 If enabled then the curvature of the second derivative of relative Arias intensity is checked to detect aftershocks and to trim the signal window. An causal filter is applied with configured parameters. 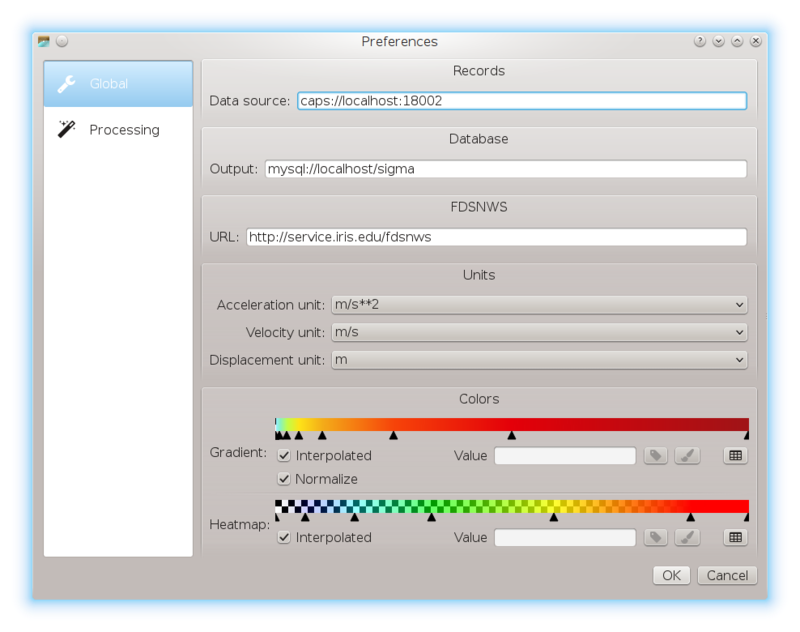 Integrate the data to achieve ground velocity or displacement. 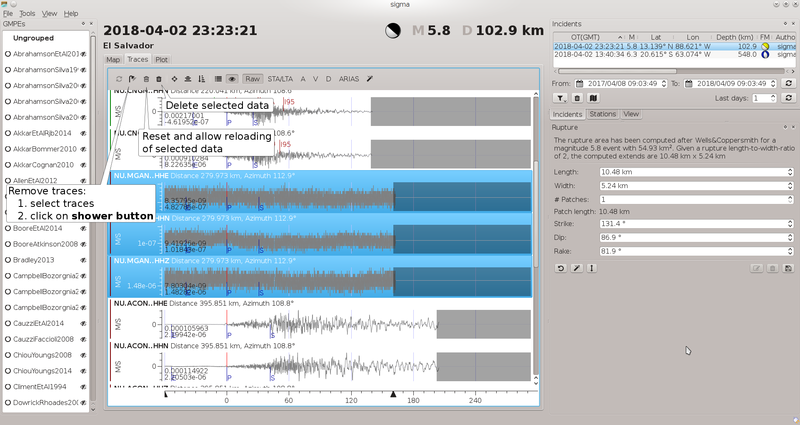 For detailed processing of individual traces, click on the trace data. This will open a new interactive Processing window in which the processing parmeters as well as the input parameters can be changed. To apply the modified parameters click Reprocess. The new window also has a Results tab in which the results values can be viewed. Click on Commit when the processing is finished to keep the modified values in SIGMA. Thereafter, processing the next trace can be started. In order to store the processing results, they must be saved as an incident in the configured database. Committing alone only keeps the parameters in the RAM. If not stored in the database, they will be lost after closing SIGMA. 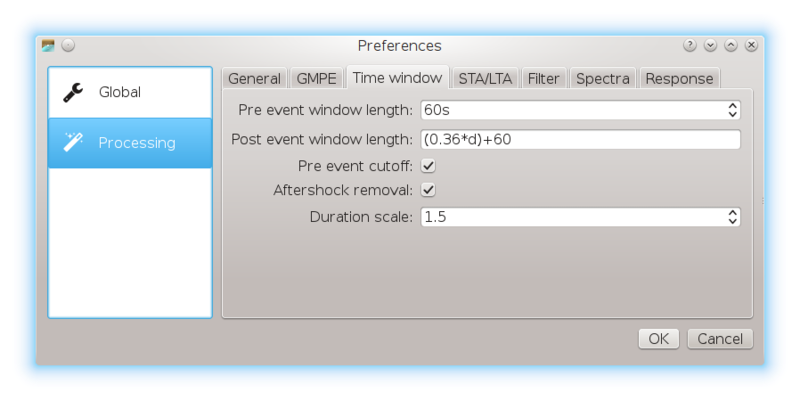 For plotting predicted ground motion parameter alongside measured and derived values choose the preferred GMPE in the GMPEs window. The eye symbol to the left of the GMPE indicates which GMPE is activated for viewing. 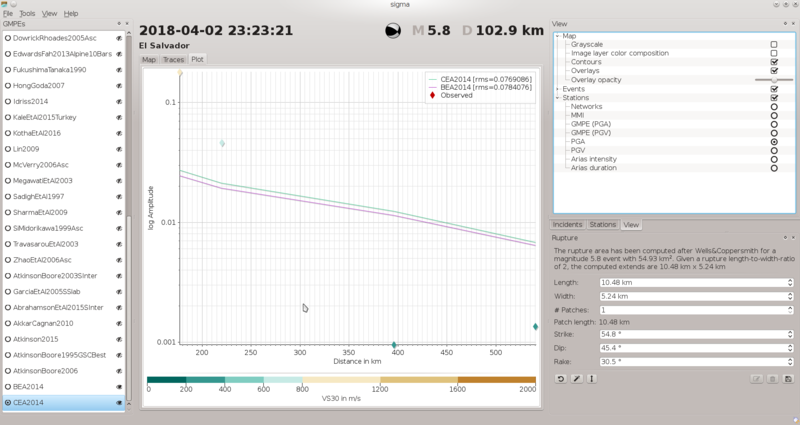 The GMPEs and the data values will be shown in the Plot tab. To actually evaluate the ground motion parameters in the Plot tab choose a GMPE in the GMPEs window and a valid parameter in the View window. This will command SIGMA to calculate the parameter values. The rms value in the legend refers to the rms residual of the values calculated based on the indicated GMPE model the reference GMPE. The reference GMPE is the selected by clicking in the circle field to the left of the name of the GMPE in the GMPEs window. When selecting GMPE, the boxes shown in the Plot tab indicate values predicted for stations. Which ground motion parameters can be calculated, depends on the selected GMPE. The GMPEs "BEA2014" and "CEA2014" provide the complete set of parameters. 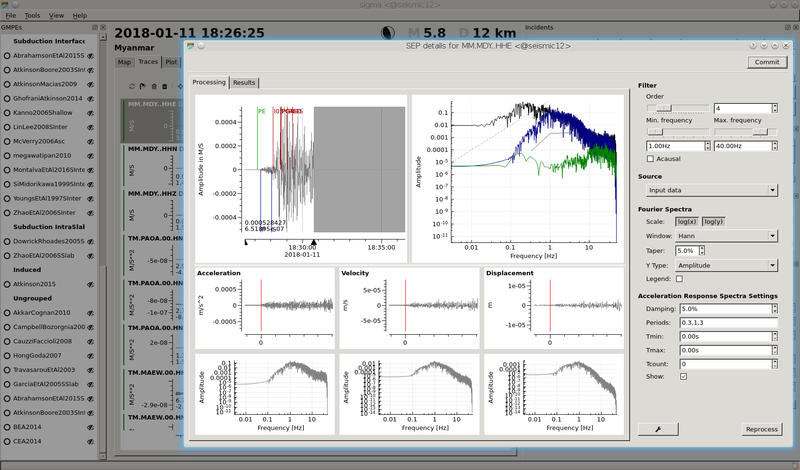 Predicted ground motion parameters can be compared with values measured at the stations by selecting all other parameters than "GMPE" in the View window. In this case, the rms value in the legend shows the difference between the predictions and the measured values. The maximum distance of involved stations depends on the configured distance and the configured maximum signal-to-noise ratio. 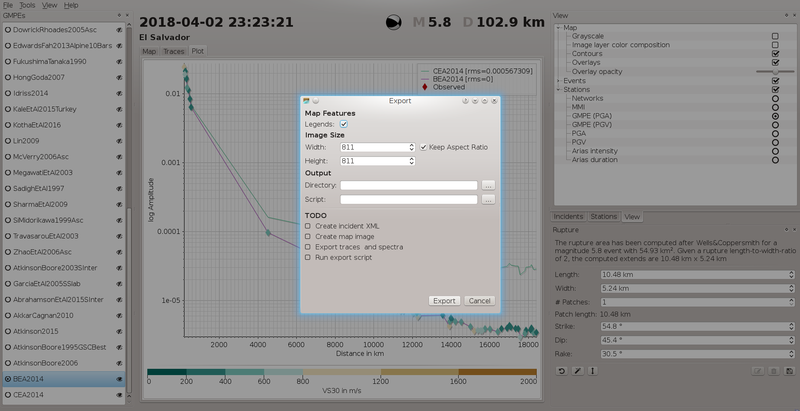 While "GMPE" in the View window refers to the values predicted based on the selected GMPEs, all other options refer to values actually measured at the station. Values at grid points without station values are always predictions. GMPEs are typically valid for a particular region or for a particular set of data. In SIGMA they can be compared and the most appropriate GMPE can be identified. In the GEMPEs window select the GMPEs which should be analyzed by clicking on the eye symbol. When the eye symbole is striked through, then the GMPE is not selected. In the View window select the PGA or PGV to compare the GMPEs with measured the data. Open the Plot window and compare the values measured at the stations with the predictions. The rms value in the legend indicates the rms residual between the GMPE and the measured data. The best matching GMPE can be identified for future processing. 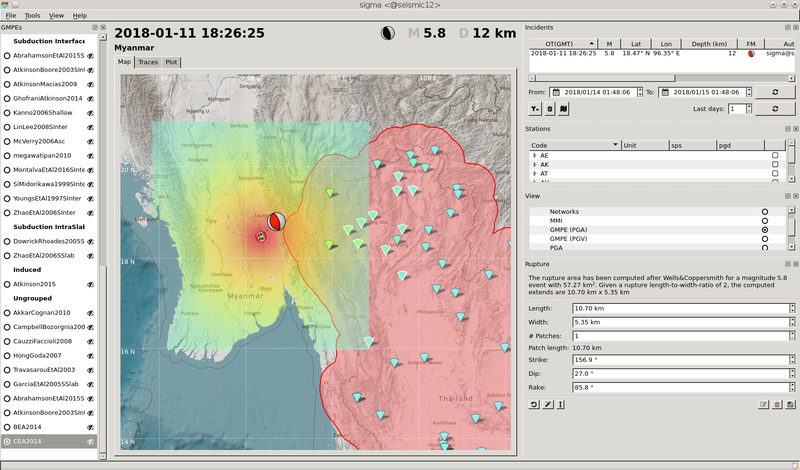 All parameters that can be calculated can also be shown on maps. Select the GMPE to be considered in the GMPEs window and the value to be shown in the View window. The color scaling is adjusted automatically. Figure 24: Predicted PGA shwon in the map window. 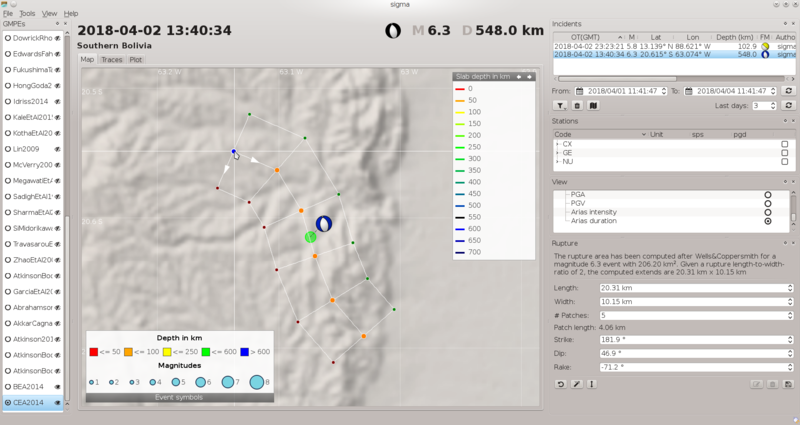 Select map features such as colouring, contours etc. in the Map section of the View window. Store the processing results as an incident in the SIGMA database in order to keep the results. Otherwise the calculated parameters will be lost. To save the incidents, open the Save incidents dialog in the File menu. The saved incidents can be read and opened using the Incidents window. Save map images to PNG files like screenshots using the File menu. Incidents can be exported and reports can be generated based on customized scripts. The scripts can take selectable input parameters. They must be provided by the operator. To invoke the export and report generation select the Export incident dialog in the File menu. Choose the output directory and the customized script along with the TODO options. The data processing is triggered by and internal incidents are based on existing events. From events SIGMA extracts the important parameters such as source and magnitude and creates the internal incidents. The internal incident can be stored into the SIGMA database. 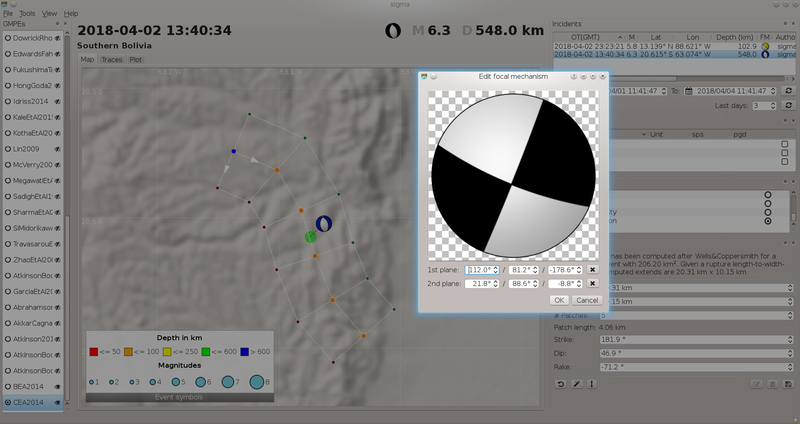 SIGMA will select all stations within processing.maximumEpicentralDistance kilometers with respect to the hypocenter. To avoid processing of redundant channels (e.g. decimated channels) or channels that do not record ground motion (e.g. 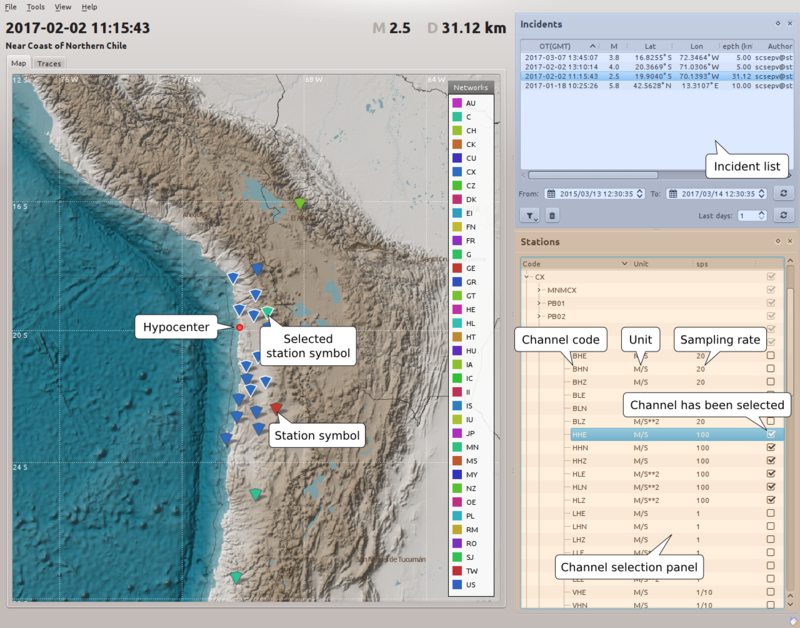 temperature), SIGMA selects a set of channels for each station which will be processed if data are available. The list of incidents is by default located at the upper right area. The calculations can be customized within SIGMA. To make permanent changes adjust the configuration parameter using scconfig. Restart SIGMA to make use of the changes. General and processing parameters defined by the configuration can be adjusted by the user within SIGMA using the Preferences dialog of the File menu. The changes will be applied on-the-fly. The applied parameter changes are only available while SIGMA is executed. Any change will be lost after SIGMA is closed. 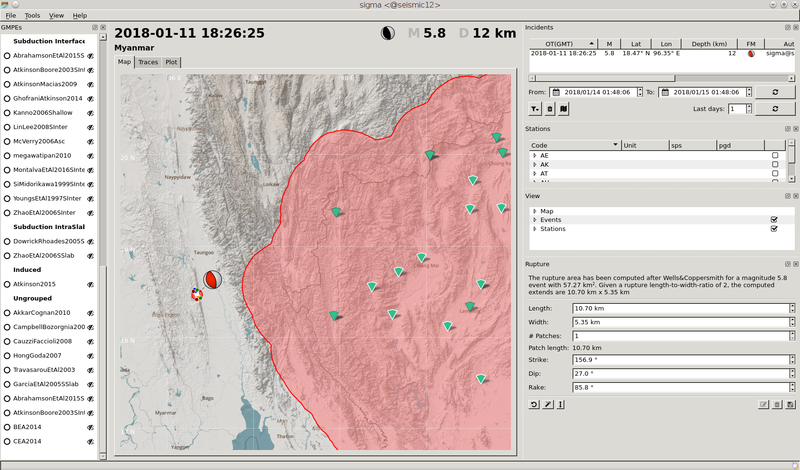 The SIGMA GUIs is composed of several windows (widgets). 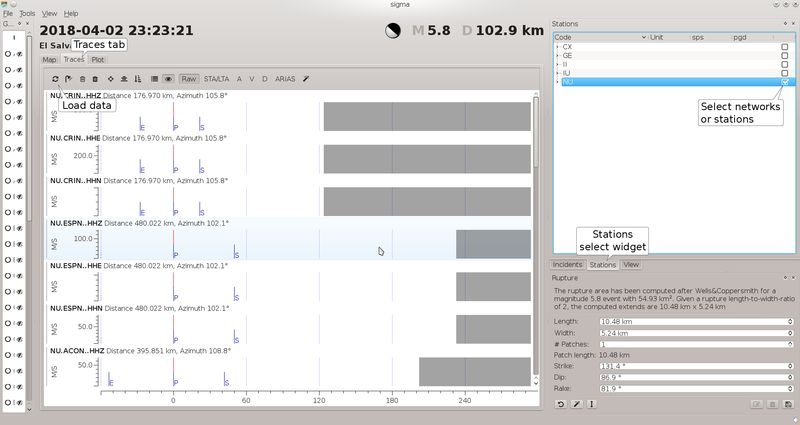 The widgets show parameters in tables, diagrams or maps or allow interactive control of the data processing. Click on the widget header on the top of each widget and drag the widget using the mouse in order to re-arrange the widget. Figure 27: Place a widget by dragging with the mouse. Widgets may be chosen to be hidden or made visable by selecting the respective window in the Windows section of the View menu of SIGMA. General parameters can be set in SIGMA by the operator. To access the parameters open the Preferences dialog in the File menu of SIGMA and choose the Global section. The changes are immediately available when pressing OK.
Parameters controlling the data processing and prediction can be adjusted in SIGMA. To access the parameters open the Preferences dialog in the File menu of SIGMA and choose the Processing section. 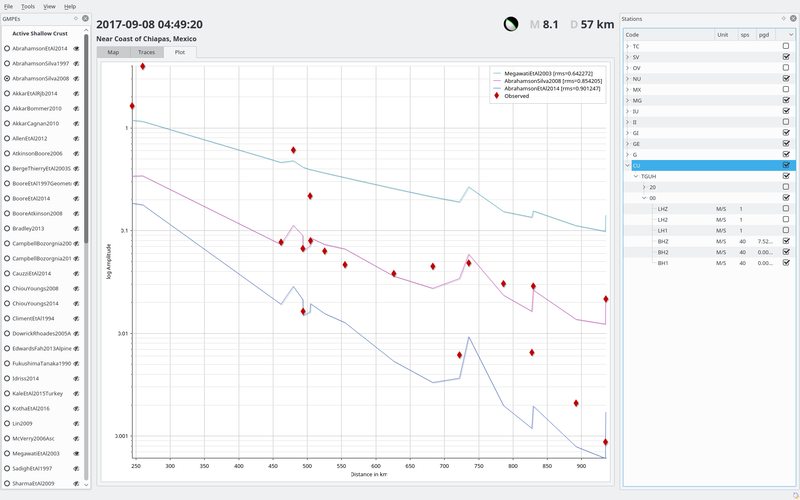 The changes are immediately available when pressing OK.
Release version 2019.088#e296272 © Copyright 2018, gempa GmbH.